Beat the heat with our week-long series on frozen treats! Written by Kristen of Dine and Dish. I remember it like it was yesterday… my first taste of strawberry granita. The fresh strawberry flavor combined with the sweetness of the sugar had me hooked at first bite. It was in a little township outside of Pittsburgh, PA, of all places. We were vacationing with my sister-in-law and the temperatures had shot up well past 100 degrees. We had reached the end of a fun-filled day when my sister-in-law introduced us to a little place called Rita’s Ice. Desperate for my new found favorite treat, I even went so far as to see what starting a Rita’s franchise in our town would entail. My husband talked me down and promised that it probably wasn’t necessary to go to those kind of measures. I guess he was right. It never crossed my mind to try to re-create the strawberry granita we tasted at Rita’s in Pittsburgh – until now. Little did I know that such deliciousness could be made in my own kitchen with just a few simple ingredients and my freezer. I can have my strawberry granita in Kansas and I’m a happy girl! Combine diced strawberries and sugar in a medium sized bowl. Toss and let sit for 30 minutes until flavors meld. Add strawberry/sugar mixture, water and lemon juice to a blender. Blend on high until smooth. Although not necessary, at this point you can pour the mixture through a sieve to remove excess seeds. Pour blended mixture into an 8×8 glass baking dish. Cover with foil and freeze for 3 hours. Remove from the freezer. Using a fork, scrape strawberry mixture off the edge of the baking dish. Gently combine. Cover and freeze for another 3 hours or overnight. When ready to serve, use a fork to gently mix the ice granita mixture. Serve plain or over ice cream or custard. What is a frozen treat you want to recreate at home? Yum – I love granitas, and strawberry is the perfect flavor!! Delicious! We’ve been to Rita’s in Pittsburgh – Yum! Sounds delicious. I can’t say I have ever seen granita at our local Rita’s. I really miss Dairy Queen’s Misty Cooler. Which was the Mr Misty unflavored Ice mixed with fresh fruit and a small amount of the fruit’s juice. The Misty Floats were good as well (Ice cream in the middle of a Mr Misty). Now they just have their Arctic Rush and the flavor syrups have changed. 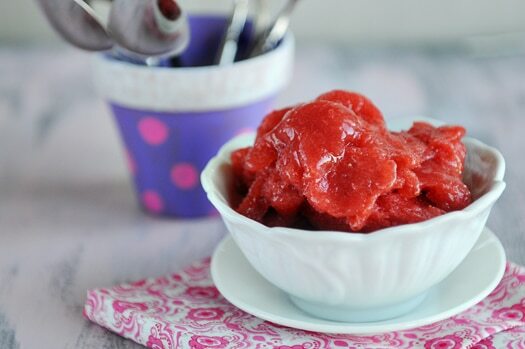 I just made a trio of sorbets that I loved but during the process what crossed my mind was that I need to try a granita; thinking they might be something of an adult version of a snowcone. No strawberries in the house but I’m eyeing plums that need to be used NOW! Oooh, this sounds delicious! Can I skip the freezing and scraping steps by pouring it into an ice cream maker, letting it do it’s thing, and then freezing it in a container? Was just given a new ice cream maker, so I’m curious about how much I can use it for…. Seriously, of all places…. It’s funny that you first tried water ice near Pittsburgh, since the Rita’s chain is actually Philly-based! If you’re ever in New Jersey, I’ll take you to The Lighthouse for a Creamsicle (fresh orange ice and vanilla ice cream together). So summery and refreshing, especially on an 87 degree day like today! That reminds me of a lemon sorbet I always used to get when I was a kid during the summer, it was served in a scooped out frozen lemon shell, great presentation. I’ll have to try and re-create that one day. Maggy was the first one to take us to Rita’s, and I think James thought he’d died and gone to heaven. I prefer the custard on its own.. I know I’m weird. But James ADORES the strawberry ice. He’s going to love this. What a refreshing and healthy dessert! I love sorbets and this granita looks like my next fav! Just gorgeous!!! I love how you teach me new things and give me the courage to try it myself! Thank you! Or, you could feed your kids vegetable ice cream! Not just delicious…beautiful! This summer I’ve been eating a lot of frozen fruit. Well, I’ve been eating a lot of ice cream too, but the frozen berries are a nice distraction when I’ve already had too much ice cream. I love the ease of making a granita (mostly I like to avoid cleaning the ice cream maker). 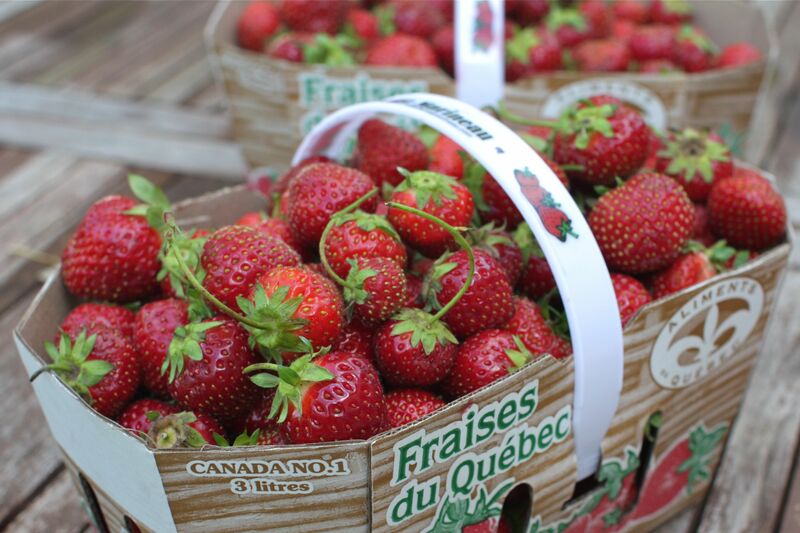 I need something cool and strawberry-y (yeah, made that word up). I’m in Kansas, too (Wichita), and the heat is killer.